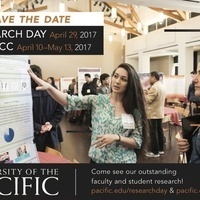 Pacific's annual events Research Day and Pacific Undergraduate Research and Creativity Conference (PURCC) combine once again to celebrate faculty, staff and student research and scholarship. This is a great opportunity for Pacific faculty, staff and students to showcase their research and for the university community to see the outstanding research happening on our three campuses. Visit the Research Day webpage. This is a fantastic event. Bravo.